The organic grocer’s less expensive, smaller-format store will debut at Bellevue Square in mid-September, with Seattle’s Wild Ginger Kitchen running a dining area inside. Whole Foods has set Sept. 14 as the opening date for the Bellevue Square location of 365 by Whole Foods Market, the organic grocer’s less expensive, smaller format store. Wild Ginger Kitchen has been chosen as the local partner to operate a fast-casual dining area inside the new store, Whole Foods said Wednesday. Whole Foods announced last year it had picked Bellevue Square as one of its first locations to try out the smaller-format stores, which are designed to combat Trader Joe’s as well as Costco, Kroger and Wal-Mart, all of whom are eating into Whole Food’s market share. The 365 stores, which are a fraction of the size of regular Whole Foods stores and cost less to build and operate, are slowly opening along the West Coast. The first opened May 25 in Los Angeles. 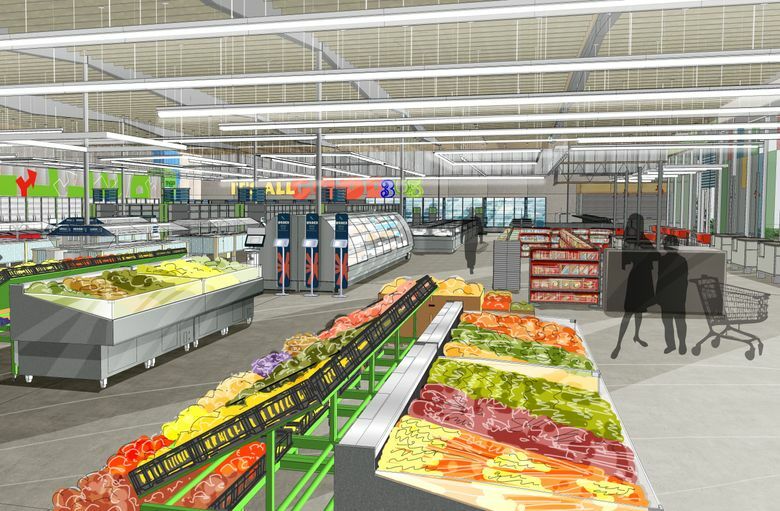 A second store will open July 14 in Lake Oswego, Ore., according to Whole Foods. Bellevue will be its third location. The company expects to open up to 10 more of the stores in 2017. “We saw downtown Bellevue as an ideal choice for our third store because it is a rapidly growing community,” Jeff Turnas, president of 365 by Whole Foods Market, said in a news release. Austin, Texas-based Whole Foods is counting on the 365 stores to help turn around its fortunes. The company’s share price tumbled about 36 percent last year, as sales growth at stores open at least a year declined quarter by quarter. In its most recent quarter ended April 10, comparable store sales — sales at stores open at least a year — decreased 3 percent. Whole Foods executives hope the smaller stores will reach a broader customer base, including more value-conscious shoppers and those wanting a simpler shopping experience. Seattle-based Wild Ginger Kitchen was selected as the Bellevue location’s “Friend of 365” — local vendors who set up shop within each of the stores. Wild Ginger Kitchen’s dining area will offer customized bowls with a choice of chicken, beef or vegan protein served on rice or noodles, along with fresh toppings, according to Whole Foods. Online ordering and delivery through Instacart will also be available through the Bellevue 365 location.